$1.00 off 6 packs and 4 inch and $2.00 off one gal. It is that time of year where many of you are chomping at the bit to get tomatoes and peppers and all those other wonderful warm season vegetables in. You might already have seen the full gamut at another store that sells them. Here at the nursery we try to be a little more cautious. We had frost yesterday. Cobb, Konocti and Mt St Helena are snow topped. I know there are quite a few of you that live in the ‘banana belts’ around here and now that it is April will probably be fine, but here the cucumbers and basil are frosting in the greenhouse!!! That being said, next week’s weather is forecast to be nice. We do have quite a few tomatoes and peppers in stock. We have a limited supply of zucchini and crookneck. I still recommend waiting to plant basil, cucumbers and melons as they really want the soil to be warmed up but we do have a few. You can hedge your bets by using the Season Starter wall of water for your tomatoes and peppers. These provide amazing frost protection and the ‘floating’ row cover cloth for your seedlings and other things. We do sell these at the nursery. April is the month that Green-All Soil Booster buy 3 get the 4th one free offer is on. It is the orange bag. We highly recommend this to add the nutrition value back into your vegetable and annual beds. It is our compost. We also sell the high end Bu’s Blend Bio-dynamic compost which is excellent, along with worm castings, chicken and steer for those of you who ‘mix their own’. For vegetable beds add some E.B. Stone Tomato and Vegetable Food and some lime or gypsum for good results. And don’t forget the E. B. Stone Sure Start. All of these products are organic. We have added worms to our selection of beneficials. They are in the refrigerator along with the nematodes and ladybugs. Our petunia selection covers a whole table and once again we are growing the fabulous Proven Winner Supertunias in the greenhouse. I have not even had room to bring them up but a few of them are starting to bloom. Some of the favorites from past years are Raspberry Blast, Pretty Much Picasso and Citrus. We are also growing the Superbells Lemon Slice and the new Pomegranite along with the favorite Dreamcicle and Lemon Saffron. 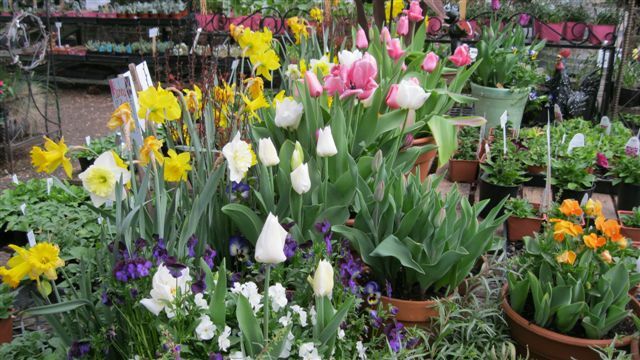 The advantage to all of these is they will take frost so you can feel confident about planting them now, along with things like alyssum and snaps. You still have to watch out for frost with things like zinnias, marigolds, sunflowers, nasturtiums and lobelia. Just ask if you are not sure and expect to get more frost at your house. Summer bulbs are here. Time to plant dahlia tubers (these do require a lot of water and gophers love them), lilies, crocosmia (these are wonderful), gladiolas, tuberose, cannas and the like. We do carry gopher cages. Check out some of the new plants we have- ‘Stained Glass’ hosta, peonies, a few interesting daylilies, different boxwoods, peach angelheart nemesia and orange bidens. We also have the much advertized Digiplexis foxglove cross but they are not cheap. This plant was all the rage at the shows last year. We want to sell trees and this month we are having an early season special of 20% off on all of our newly potted and not so newly potted deciduous fruit (does not include citrus, olives or avocado) and shade trees. For those of you who think you have everything you might want to try the Jujube. These are known as the chinese date, and apple like taste when fresh and dried are date like. They love the heat and do well here. The nursery is once again looking colorful and magical. Time to plant some of your own.